Stamp a Sweet Impression: Our Friday Friend and TOP CHEF!!! Our Friday Friend and TOP CHEF!!! We got so many awesome entries for this round of Top Chef - wow! Thank you so much to everyone who entered! 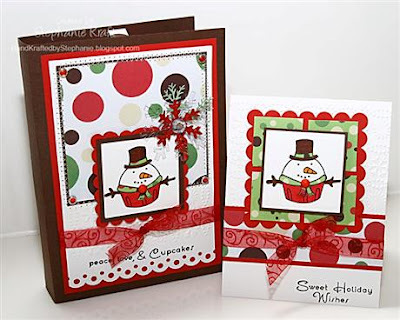 We just love to see what you create with SASI stamps. Taylor had the tough job of picking a winner and we're featuring her here today as both our current Top Chef and Our Friday Friend. So let's hear it for Stephanie Kraft (booga3 on SCS). Congratulations Stephanie! You'll get to choose a FREE stamp set from the upcoming SASI release. (Be sure to read all the way to the end of this post for news on that release *grin*) Below is Stephanie's winning TC entry - an adorable note card set in a coordinating folder. Who wouldn't love to receive this as a gift? 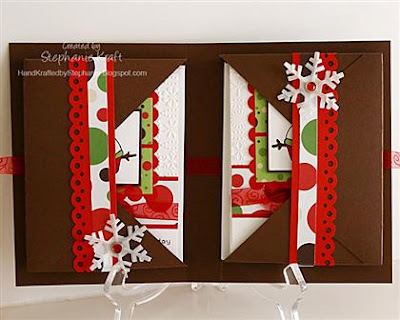 You'll want to visit Stephanie's blog HandKrafted by Stephanie and her SCS gallery, but before you go let's get to know her a little better. I was invited to a home stamp party in late 2003, but I was unable to attend. I was interested in getting back into scrapbooking (I had made a scrapbook in the late 90s of my cat -- pre-marriage and pre-kids! ), so I later contacted the demonstrator and asked if I could see a catalog. I went over to her house and she showed me some sample cards and stamps. I told her that I didn't stamp and was only interested in scrapbooking. I took the catalog home and later that night ordered a bunch of stamps and ink. I've been hooked ever since! I would describe my style as clean, simple and somewhat linear. A year ago I would have said my favorite projects are scrapbook pages, but this year I've discovered my love of stamping and creating handmade gifts such as a set of note cards or a stamped mini album. I love that I can combine stamping with both scrapbooking and card making! I love all of them and can't get enough of the cute cuppies, but my favorite image so far is the snowman from Home Sweet Home. I just adore him! I love to cook, but I'm not so much of a baker (probably because I don't like to measure!). During the holidays, though, one of my favorite recipes is for Chocolate Peppermint Crunch Cookie Bark. It's part candy (crunchy) and cookie (very yummy!). Part cookie, part candy, these shards of crisp dark chocolate chip cookie will delight holiday guests. Instead of peppermint candy, the bark could also be topped with crushed toffee or chopped white chocolate. Position a rack in the middle of the oven. Preheat the oven to 350° F. Have ready two baking sheets. Prepare the cookie base. In a medium bowl, stir the flour, baking soda and salt together. Sift the cocoa powder onto the flour mixture and set aside. In a large bowl, using an electric mixer on low speed, mix the melted butter, granulated sugar, brown sugar, water and vanilla until smooth, about 30 seconds. Stop the mixer and scrape the sides of the bowl as needed during mixing. Add the flour mixture, mixing just until the flour is incorporated. Stir in the chocolate chips. Leaving a 3-inch border empty on all sides, use a thin metal spatula to spread half of the dough on one baking sheet into a rough rectangle that measures about 11 by 8 inches and is about 1/4 inch thick. Use the palms of your hands to help pat it into an even layer. Repeat with the remaining cookie dough on the second baking sheet. Bake one baking sheet at a time until the top looks dull, not shiny, and feels evenly firm at the edges and center, about 14 minutes. As soon as each baking sheet comes out of the oven, sprinkle 3/4 cup of the chocolate chips over the cookie slab. Let the chocolate chips sit for 5 minutes to soften and melt, then use a small metal spatula to spread the melted chocolate over the cookie, covering most of the cookie. While the chocolate is still warm, sprinkle half the peppermint candy evenly over the slab. Let the cookie bark cool on the baking sheets on a wire rack until the chocolate topping is firm, about 2 hours. Or, to speed the cooling, cool the cookies on the baking sheets for about 30 minutes then refrigerate them, still on the baking sheets, just until the chocolate topping firms, then remove from the refrigerator. The cookie bark will become crisp as it cools. Break each cookie slab into about twelve 5- to 6-inch long irregular pieces. The cookies can be stored layered between sheets of wax paper in a tightly covered container at room temperature for up to 5 days. Whoa! That sounds incredibly yummy! Thanks Steph! And congrats again! And how about you - would you like to be Our Friday Friend? No contest to enter for this. Are you ready for some brand new SASI stamps? Well the wait is almost over! In just two weeks on Friday January 2nd Taylored Expressions will present the largest ever release of new Stamp a Sweet Impression sets and I'm telling you, you are going to flip! So plan to ring in the new year SASI style with some sweet new rubber and brand new papercrafting products! Wow! These cards are wonderful! I love all the fun colors and papers. Great embellies too! what great cards/holder & the recipe sounds yummy!